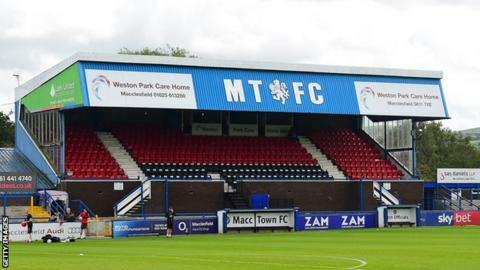 A Macclesfield Town supporters' group has threatened to stop giving money to the club after players and staff were not paid March's wages on time and a terrace was closed at Moss Rose. Silkmen Supporters' Trust also said in an open letter that it would request all volunteers withdraw their labour. It is the second successive month, and third time this season, wages have been paid late by the League Two strugglers. "The SST board is not prepared to just sit back," the letter continued. "If a satisfactory response is not received by 5pm on Monday 1st April 2019, the SST board will undertake serious consideration as to not only initiating a request for ALL volunteers to withhold the labour that they currently freely provide to the club, but withdrawal of all monetary support and Super Silk Lotto to the club until a prompt and successful resolution of these issues." Sections of the London Road terrace were closed prior to Macclesfield's 2-2 draw against Stevenage on 23 March "as a result of intimidating behaviour and abusive language", the club said. Salaries for March were due last Friday, but have still not been paid by the club. Macclesfield declined to comment when contacted by the BBC.